WOW! It’s has been FOREVER since I have posted our letter projects. In fact Letter N is from way back in September! I’m going to try and catch up on our letter of the week posts over the next two weeks so bear with me! I’m going to have to use pictures to help me remember all that we did! 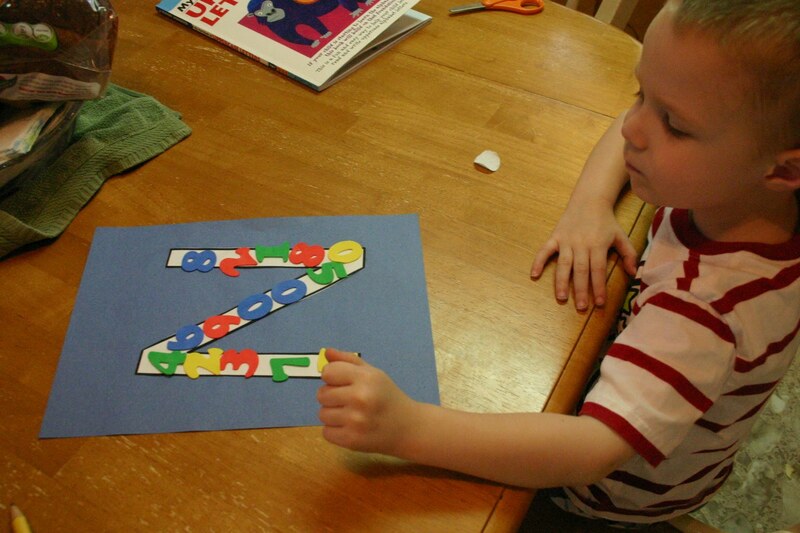 Luke also worked in his Kumon Uppercase Workbook and did Homeschool Creations Letter N Collage! 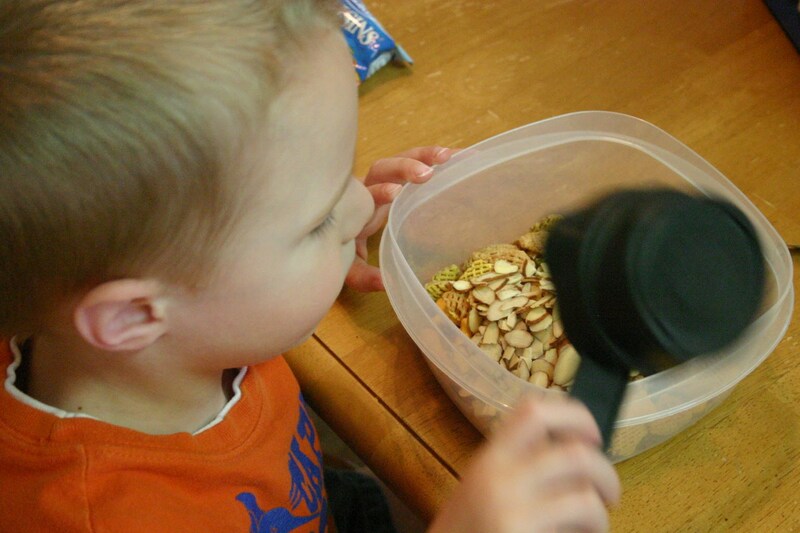 Luke made some snack mix that was full of yummy things.. especially Nuts! We talked about different kinds of nuts and how good they are for you! He also did some cutting practice! He is really improving! 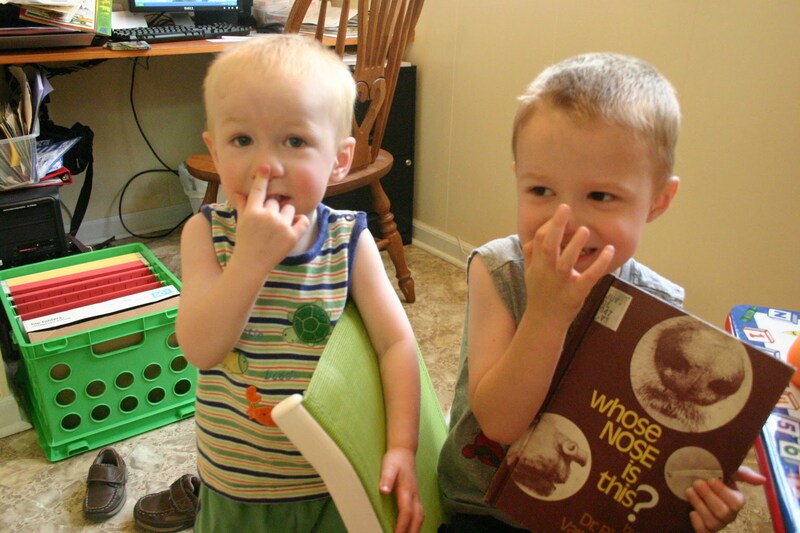 And we found this old and funny book about Noses at the library! Each page has a picture of a nose and you have to figure out what animal goes with the nose! We also read some different books about the sense of smell and how our nose works! 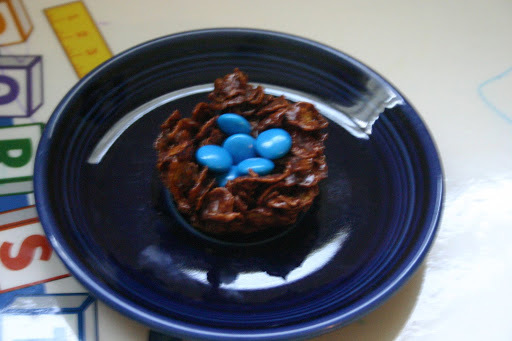 Our favorite part of the week was making these cute little bird’s Nests from Mama Jenn’s blog! 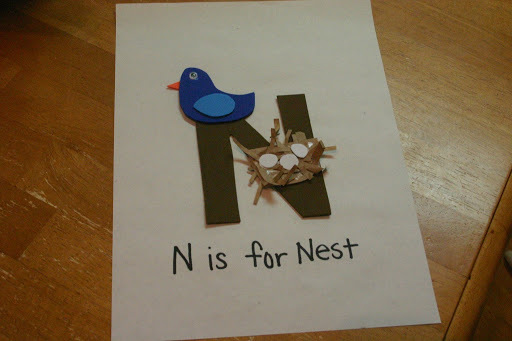 And then we made N is for Nest from Totally Tots! 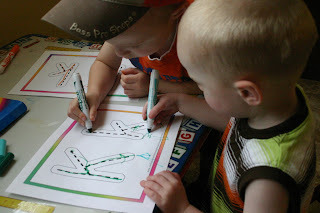 We started off the week talking about thing that start with the letter K. The boys colored/traced their letter K‘s. 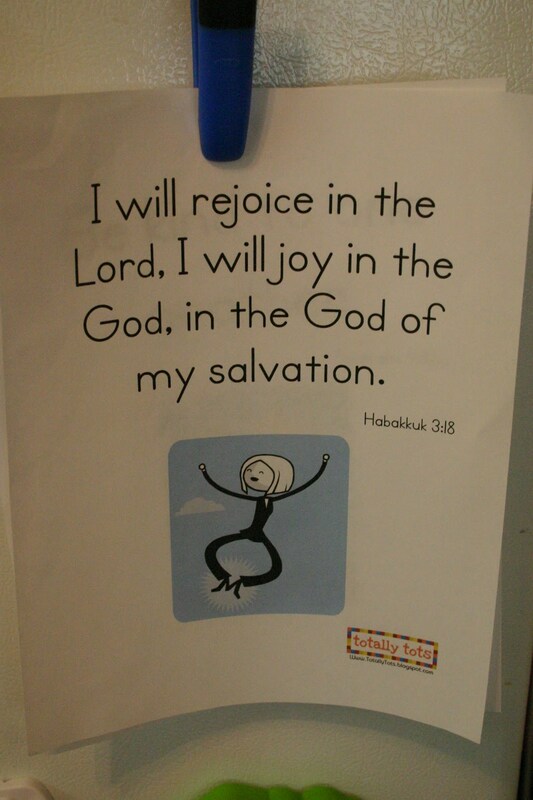 I got these printables from Confessions of a Homeschooler. We typically do these every week, although I don’t know if I always get a picture. 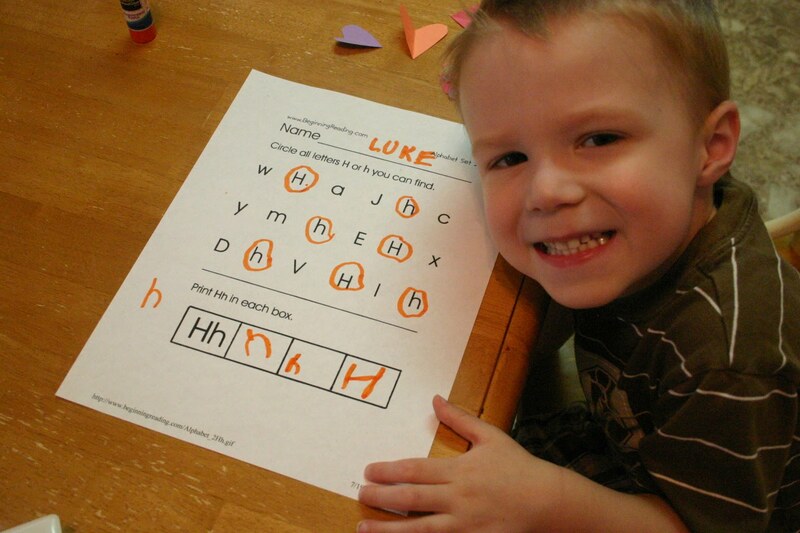 I usually go over how to correctly write the letter and then Luke traces his. Then he usually colors his in. Here he is helping show Eli how to draw his K! We also took a trip to the library and to our surprise one of the story time books was about a Kangaroo. Then all of the kids colored a picture of a Kangaroo! 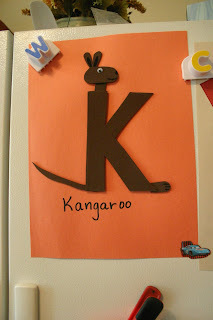 We also did a Totally Tots alphabet craft, which was a Kangaroo. Luke and I also watched some videos on the National Geographic website and learned some facts about two different types of kangaroos. Did you know that kangaroos hop because they cannot move their legs independent of one another? Well, now you know! There is also a species of kangaroos that live entirely in trees! Next we made a letter K out of popsicle sticks. Luke colored them and then I hot glued them together. I couldn’t take a picture of it because a certain little guy broke it! Luke also colored two more popsicle sticks to make a Kite! Luke had lots of fun “flying” his kite around the house! Then we read Hamlet and the Enormous Chinese Dragon Kite! Our verse this week was “Be Kind to one another.” Ephesians 4:32a. We talked about what it means to be kind and all throughout the week we pointed out different things that the boys did that were kind! We also made homemade popcorn and did some fun measuring and sorting with some extra Kernels! I gave Luke a cup full of popcorn kernels in a bowl and then gave him several different measuring cups and spoons. We measured out basic measurements and then I just let him have fun playing and scooping them from different containers! Hello, math! Well, that catches us up! Next week we will start Letter L! Updated with the pictures from the week! Yay, I found my cartridge! So, I’m WAY behind on posting our letter of the week projects! I’m planning on posting both today, if I have time. We took 2 weeks off, one for when my sister came home and we took a mini-vaca and then this past week I took off to get my planning finalized for our pre-k year. Basically we’re doing the same letter of the week but I’m adding more things, which I’ll talk about later.. you know, when I have time! Well, I was SO disappointed when I got on the desk top to find that I hadn’t yet uploaded the pictures from weeks J and K. So, I go to look for the memory card.. and it’s gone! GONE! I have a feeling I might find it later considering I’m pretty sure my youngest little guy walked off with it.. and if so I’ll just come back and upload the original pictures. I had changed the memory card out in my camera to upload pictures from Eli’s party. I’m just thankful that I had already gotten the pictures from our trip to TN and Eli’s birthday party uploaded! I would much rather have those than our crafts! So, this morning I got out most of what we did and took pictures of them…. We started off the week with a Letter J clip art collage. We talked about all things that start with the letter J! Our first letter J project was a J covered in Jewels! 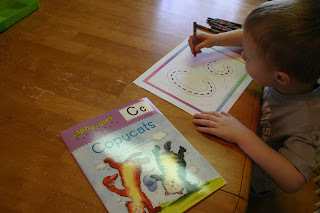 Confessions of a Homeschooler has some great alphabet printables that you can cut out and use in crafts! We also did a Totally Tots letter craft- Jaguars! We picked up a book at the library and read all about Big Cats!! Especially jaguars! This was a fun craft! 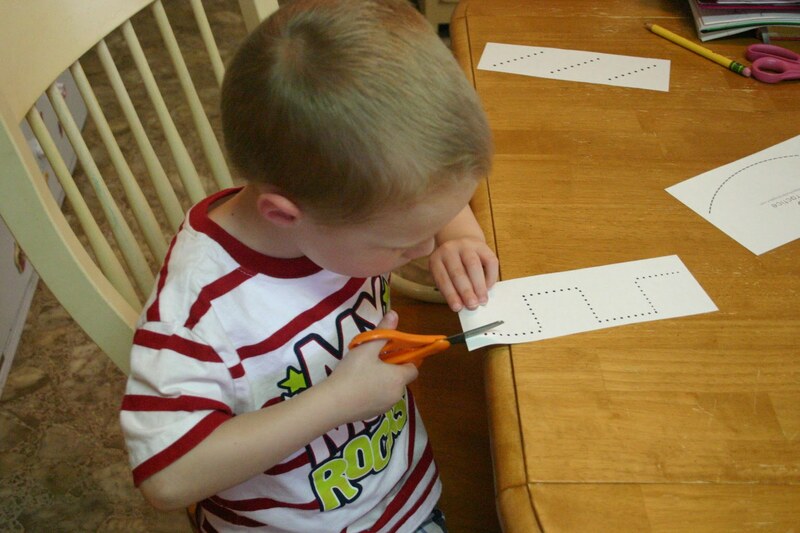 I drew out the simple shapes for Luke and then he practiced his cutting. He cut most of them out by himself, but asked me to cut out the circle and the red rectangle! Then he glued them all together to make a Jack in the Box. It was a great way to practice cutting and review shapes and colors! Here is Luke working on his Jellyfish! We learned some interesting facts about jellyfish this week! I don’t have a finished product picture but it was easy to make. 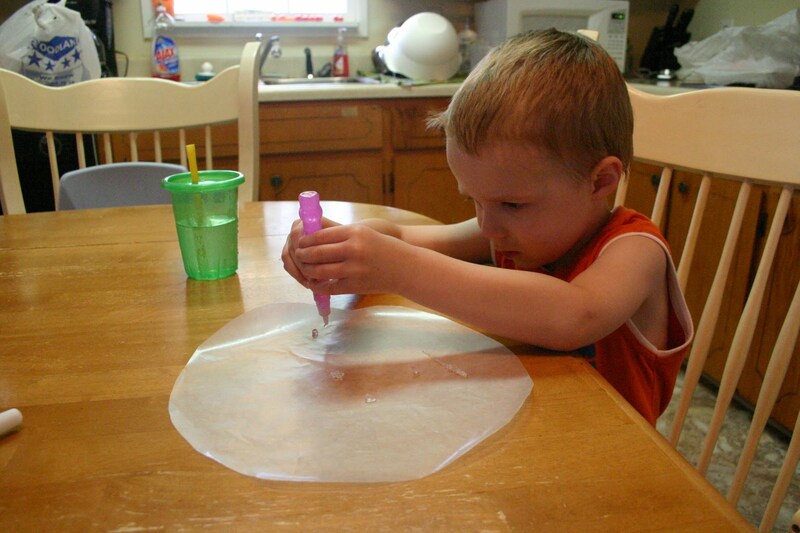 Cut a large circle out of wax paper. Use glitter glue on one side of the circle and then fold in half. When dry hole punch holes alone the folded edge and tie curling ribbon to hang down for tentacles! 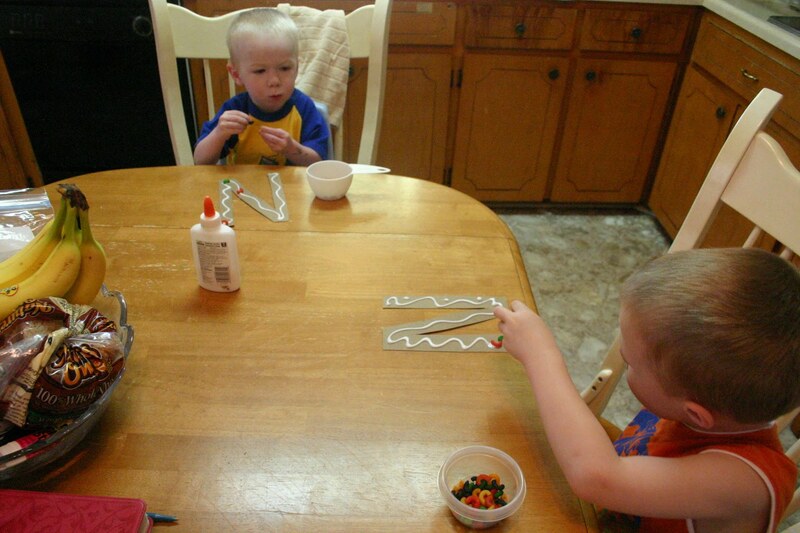 We also had some fun with Jelly Beans! I put some jelly beans in a jar, a very small jar, and we all guessed how many there would be! Then we counted them. I think there were close to 80 in there. Then we tasted them and guessed what flavor they were! Luke and I both agreed pop corn flavored jelly beans are gross! We also read a book about counting jelly beans! This verse is one of my favorites that we’ve memorized so far! What JOY there is in knowing Christ! And how exciting to be able to share that joy with my boys!! We talked about the difference between worldly ‘happiness’ and the joy we get from knowing God! Well, that’s all I can remember. I’m sure we did more.. but without pictures, I just can’t remember.. it’s been almost a month! We started out last week talking about the letter H and Hearts! 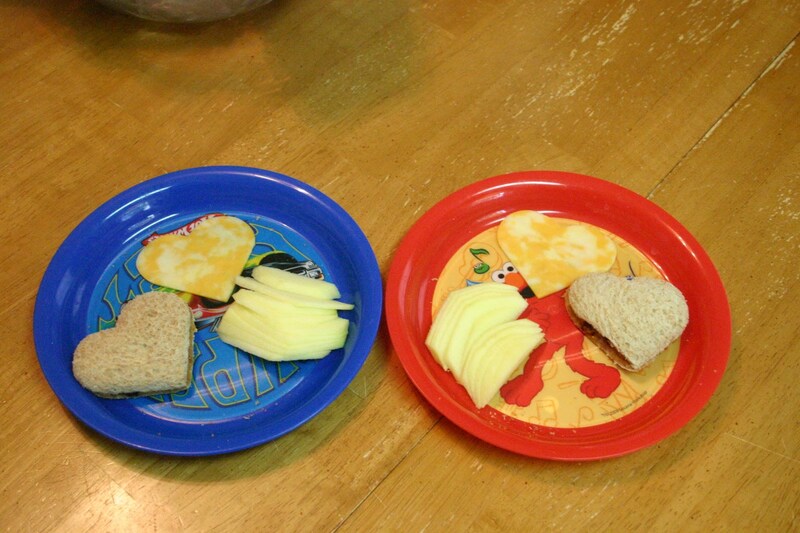 Here is their heart lunches, heart shaped PB&J and cheese with apple slices! 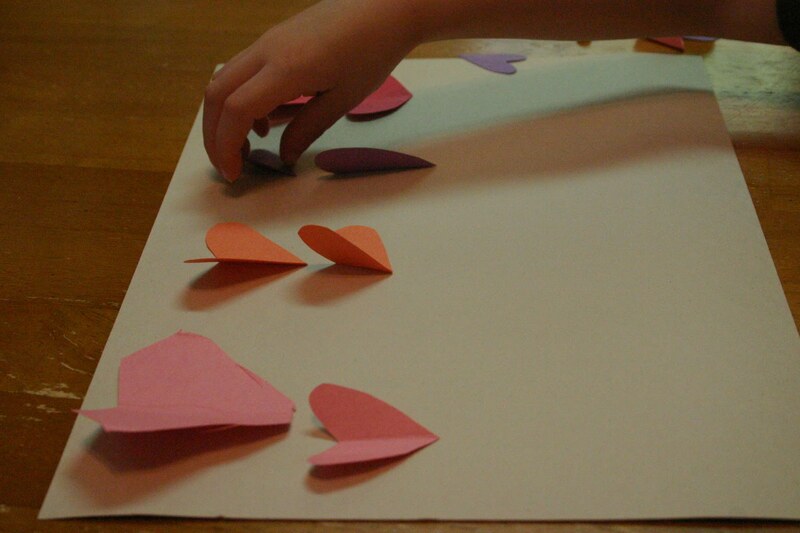 Next, I cut out Hearts in different sizes and colors for Luke to sort! Well, he cut out one, can you tell which? 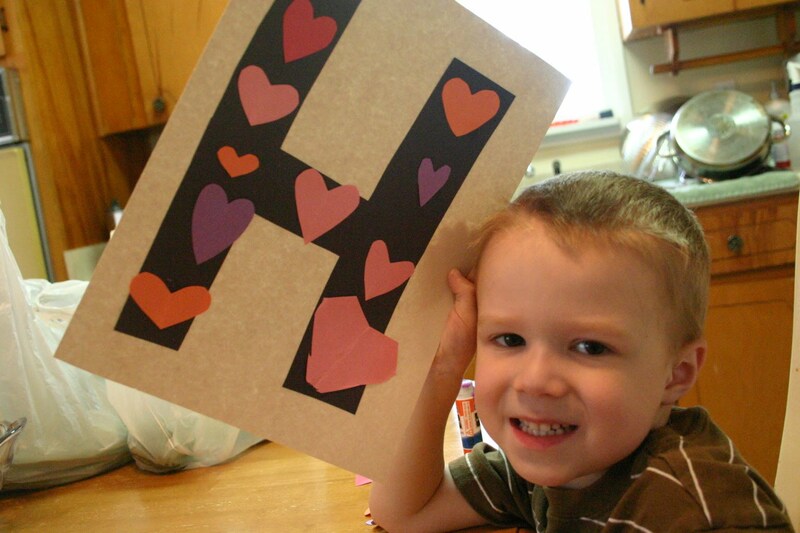 Then he glued the hearts on a big letter H. He also used the scraps of paper to build letter H’s! Our next craft was probably my favorite of the week! Eli even got to help out with it! 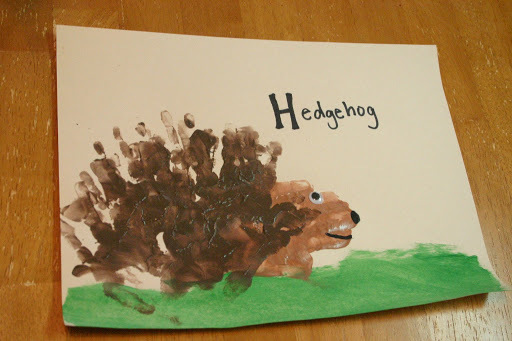 Here he is making his grass for his Hedgehog! Actually that is all Eli did. When it came time to put his hands in the paint… he was not interested. So I ended up making his! Luke’s turned out great! We watched a Hedgehog video on National Geographic Kids and learned about them, too! 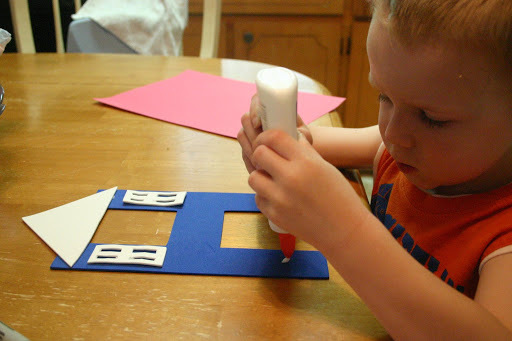 Our Letter H craft comes from Totally Tots. H is for House! It turned out super cute of course! After making the craft we read, This Is The House That Jack Built. We also practiced using a Hole punch and then Luke made an H out of all of the little dots (fine motor skills at work!). We finished up the week doing a letter H search. We also did Letter A-D searches for review too! I don’t mean to be a Debbie Downer today! I just want my boys to be able to enjoy the weather! At the end of March we worked on the letter C. Our Bible verse was, “Therefore if anyone is in Christ, he is a new creation.” 1 Corinthians 5:17. 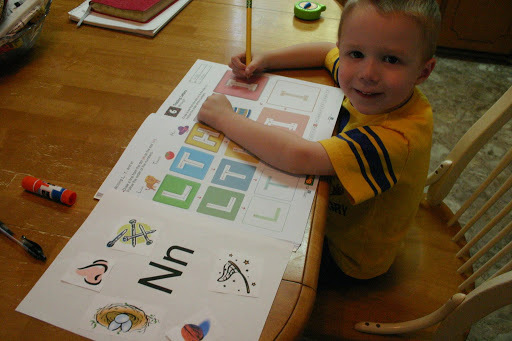 Here is Luke practicing making his C.
We also had a fun caterpillar snack: Peanut butter on Ritz crackers, pretzels for feelers and raisins for eyes! 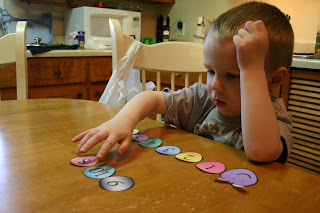 And from Confessions of a Homeschooler, I downloaded this cute caterpillar number sequence game! Luke had fun putting the numbers in order! He’s also asked to play this game several times since then! I wish I had a laminator so we could use these for longer! 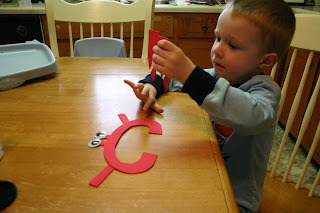 I found a cute letter C craft for our alphabet book that went with our caterpillar theme but when I saw this C is for Crab craft from Totally Tots, it was too cute to pass up! Isn’t it super cute?! 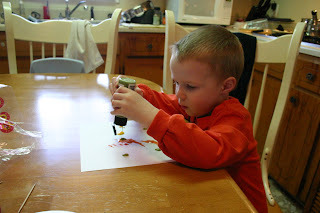 We did do a few Easter themed crafts but I don’t have pictures! It was the week we were staying at my mom’s because of the bath remodel. I forgot my camera! I’ll share our April crafts later. We’re only doing two letters this month, also because of the bathroom remodel. It’s technically not finished (just painting the door is left) but the majority of the work was finished yesterday. So, it took longer than expected and kind of threw our schedule off! Ok, off to get lunch started! Last week we did this craft project as we learned about the life cycle of a butterfly from Mama Jen’s site (She has so many great ideas!). Luke really had a lot of fun making everything! I was a little worried that our styrofoam egg cartons wouldn’t work but they did fine.